In my northern Sydney’s suburbs garden, I planted Eucalyptus preissiana ten years ago, after bringing it back from Western Australia (with a quarantine clearance). It has ‘mallee’ habit, that is, multi-trunks arising from a lignotuber and has only grown to 1.5 metres high by the same width. In the wild, it grows to 2 to 3 metres in height by a similar width. I am growing it in a position that receives nearly full sun in a thin layer of soil over a clay base. Not the ideal position, as it grows naturally on sand and gravel based soils on the coastal strip from Albany to Esperance in South-west Western Australia. Some years, I have very few flowers and this is because the plant is too dry. In years with a wetter winter, it rewards me with many stunning yellow flowers in Spring. It can be difficult to maintain in tropical and sub-tropical areas due to summer humidity, however the older the plant gets the better it copes with Sydney’s summer humidity. The bark is smooth and the leaves are broadly oval shape, tapering to a point - they are about 120 mm long by 50 mm wide. The new leaves are an attractive light green colour that matures to a grey/mauve colour. The large, yellow flowers in October are 30 mm or more in diameter. This is followed by attractive bell shaped seed pods. Maintenance: The only problems I have some years is white scale forming on the leaves, which are easily scraped off. As it has a lignotuber, it responds to hard pruning to near ground level if rejuvenation is required. I had great success doing this recently to a five year old E. Olivacea ‘Lorikeet’ resulting in a mass of new growth from the lignotuber. 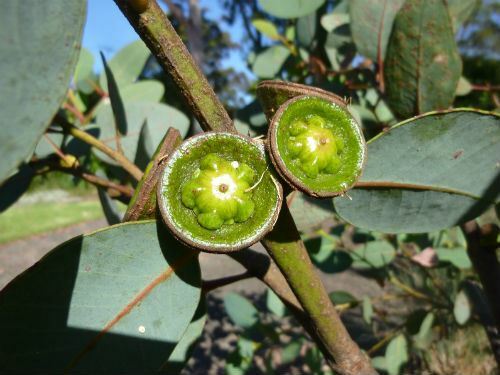 Propagation is from seed as Eucalyptus species generally produce copious quantities of seed annually. However fruits may take a year to mature after flowering. 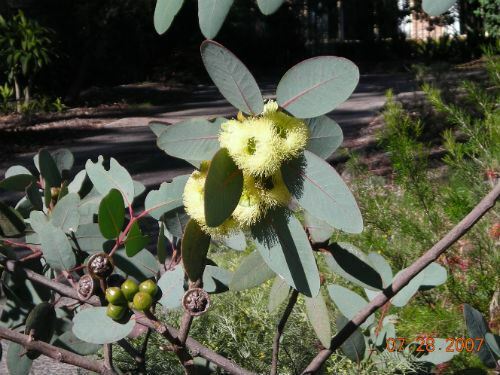 Every garden should have a small Eucalypt growing as they are the icon of the Australian landscape. 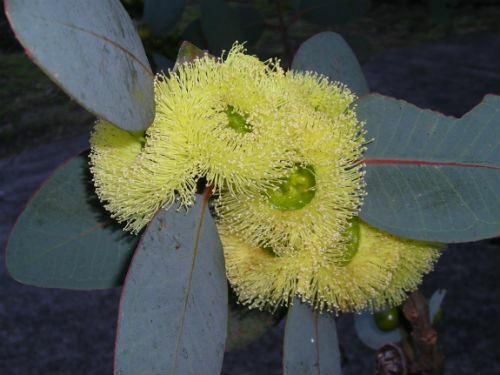 Derivation of the name: Eucalyptus... from Greek, eu, well and calyptos, covered referring to the cap which covers the developing flowers; preissiana... after J.A. Ludwig Preiss (1811 – 1883).